Cleveland is a huge city with plenty to see and do. 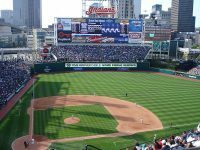 Most tourists spend their time in the downtown area, which is home to top attractions like the Rock and Roll Hall of Fame, Progressive Field, the Greater Cleveland Aquarium, and Jack Cleveland Casino. Terminal Tower, the centrepoint of the Tower City Center, has an observation deck that allows panoramic views of the city. For art galleries and museums, Cleveland's East Side is home to the Cleveland Museum of Art, the Western Reserve Historical Society, The Children's Museum, and the Cleveland Natural History Museum. The East Side is also home to the Cleveland Botanical Garden, while the Cleveland Metroparks Zoo is located on the West Side. Families in Cleveland will not want to pass up the chance to visit Cedar Point Amuseument Park, among the largest in the country and located just an hour outside of the city.